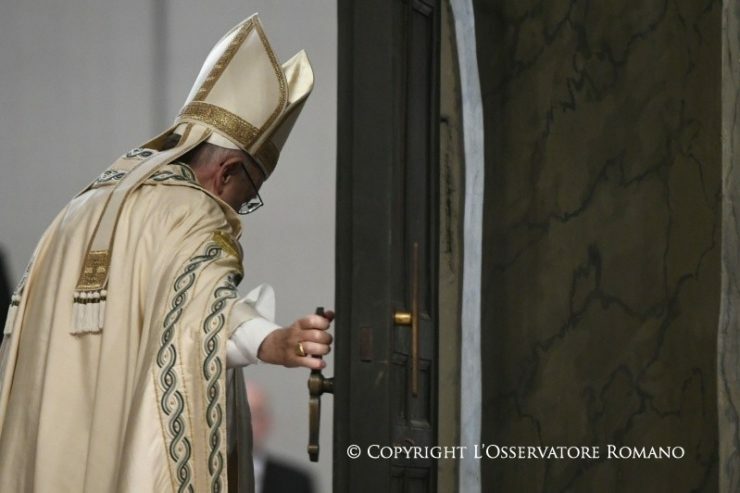 Pope Francis said this during his homily for the Closure of Jubilee Year of Mercy, Dec. 8, 2015 – Nov. 20, 2016, on the occasion of the Feast of Christ the King, as he reminded faithful how God’s mercy awaits us always, even if Holy Doors have closed. Recalling that today marks the Solemnity of Our Lord Jesus Christ, King of the Universe, the Pontiff encouraged us to proclaim His victory today, and joyfully share the splendor of having Jesus as our King: his rule of love transforms sin into grace, death into resurrection, fear into trust. The Jesuit Pontiff then went on to present three figures in today’s Gospel that appear, along with Jesus: the people who are looking on, those near the Cross, and the criminal crucified next to Jesus. Turning to the second group, including various individuals, the leaders of the people, the soldiers and a criminal, who mock Jesus and tell Him ‘Save yourself.’ Francis noted that in saying ‘Save Yourself, they are committing a terrible temptation, in trying to tempt Jesus, just as the devil did at the beginning of the Gospel (cf. Lk 4:1-13). In order to receive the kingship of Jesus, the Holy Father explained, we are called to struggle against this temptation, fix our gaze ever closer to Him and become always more faithful. This Year of Mercy, the Holy Father reminded, invites us to rediscover the core, to return to what is essential. Turning to the thief, the Gospel’s third figure, who begged Jesus to be remembered in His Kingdom, Francis applauded his faith. “He was not closed in on himself, but rather – with his errors, his sins and his troubles – he turned to Jesus, and experienced God’s mercy: “Today you will be with me in paradise” (v.43), and we are called to do the same.